I'm loving all these crafts with buttons out there (makes me want to expand my button stash!). 1. 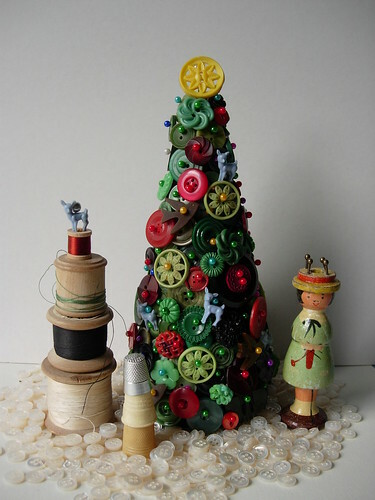 This button tree featured on Balzer Designs is amazing! I saw a simpler one in a special Christmas decorating edition by Better Homes and Gardens, but that one was made with white buttons. I like it in traditional green! 2. This might be the most beautiful Christmas decoration I've ever seen! No tutorial on this one, just a beautiful photo from flickr by maximum RABBIT designs. I'm thinking I need to scour some thrift stores for cool vintage buttons to make it! ﻿3. This button tree idea by BHG is a great way to add a special touch to a gift bag! Do any of you have unhealthy button stashes like me? Any great crafts you make to use them?